The National Accreditation Board for Hospitals & Healthcare Providers (NABH) is a constituent board of Quality Council of India, set up to establish and operate accreditation programme for healthcare organisations. The board is structured to cater to much desired needs of the consumers and to set benchmarks for progress of health industry. The board while being supported by all stakeholders including industry, consumers, government, have full functional autonomy in its operation. 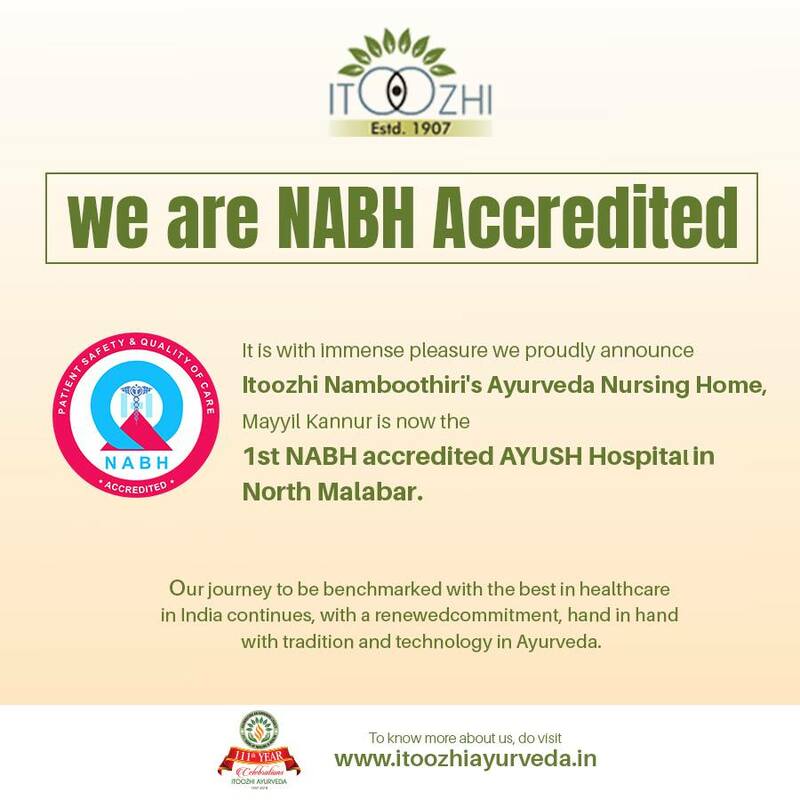 The NABH accreditation for Itoozhi Namboothiri’s Ayurveda Nursing Home falls under the Accreditation Program for AYUSH (Ayurveda, Homeopathy, Unani, Siddha and Yoga & Naturopathy) Hospitals,which is running in association with the Department of AYUSH, Ministry of Health & Family Welfare. It consists of Accreditation Standards that are based on three components- structure, process and outcome. These standards measure the quality and safety aspects of the care delivered to the patients. For each speciality i.e Ayurveda, Homeopathy, Unani, Siddha, Yoga and Naturopathy, NABH has separate Accreditation as per their individual system of medicine and requirements. Our journey to be benchmarked with the best in healthcare in India continues, with a renewed commitment, hand in hand with tradition and technology in Ayurveda.